Our book, Joseph Vick of Lower Parish, Isle of Wight County, Virginia is a beautiful 562 page leather bound document about the first five generations in this country. It is meticulously researched, edited and indexed by John Beatty and Di Ann Vick. 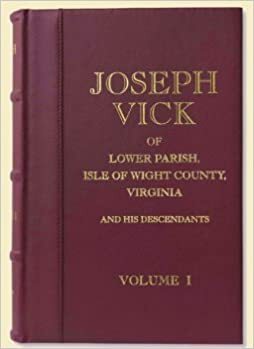 Joseph Vick, of Lower Parish, Isle of Wight County, Virginia and his Descendants, Volume 1 covers the first five generations of the descendants of Joseph Vick, who immigrated to America in the late 1600s. In addition to extensive, well-documented genealogical information, the book includes anecdotal historical information, references and foot notes. A center section includes illustrations and photographs of Vick descendants, lands and homes. John is on the genealogy staff of the Alan County Public Library, the largest collection of genealogical secondary sources (books and publications) in the United States. Di Ann has a doctorate in American Studies and is a genealogist. The book was published by Genus Publishing, which is owned by James Davis, a well-known publisher and also a Vick descendant. All profits of the sale of the book go to the family organization. We will have an index of the family names, a description of the book, information on the family, testimonials, and images, background on the editors, etc. in the near future. The book is $59.95. There is a $10.00 discount for JVFOA members. The book is also available in some libraries. Includes index. Digitized images of the index available on the Vick Family of America's Web site. Includes Barnes, Barrett, Batchelor, Brantley, Bunn, Cook, Dean, Equals, Ferguson, Gardner, Garlington, Harrelson, Hart, Joyner, Minshew, Odom, Perry, Pittman, Pope, Powell, Ricks, Storey, Strickland, Threadgill, Westray, White, Whitfield, Worrell, Yeargin and related families.